Duck Tours Fort Lauderdale offers a unique land and water tour that provides you with 90 minutes of fun. See famous South Florida landmarks and attractions while their experienced driver provides narration. Duck Tours are great for first time visitors to the area as well as resident South Floridians looking for something new to do. Duck tours also offers outings for summer camps, field trips, and private parties. Get a close up look at the mansions of the rich and famous. See why Fort Lauderdale is known as the "Venice of the Americas" and the "Mega Yacht Capital of the World". On land, travel down the famous Las Olas Boulevard and around the historic streets before splashing into the Intercoastal Waterway at the 15th Street Marina. The Jungle Queen Riverboat Cruise in Fort Lauderdale has been an iconic tour for decades. 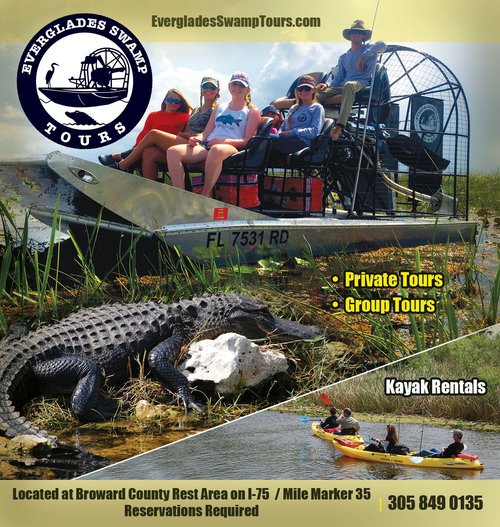 This classic Florida boat tour departs at 9:30 am and 1:30pm for sightseeing down the New River. The beutiful riverboat has restrooms and lawn chair seating for about 500. Take in the sights and relax as you watch the lavish homes and yachts roll past. Passengers are able to see a few Fort Lauderdale landmarks and see the Port Everglades cruise ships up close. The sightseeing cruises make a stopover at their own secret island for a brief alligator encounter and show. There is a small snack shack that serves up refreshments and a larger restroom (in case you're not into using a boat bathroom). You can make an evening of it by taking an evening dinner cruise with all you can eat BBQ and shrimp accompanied by live variety show. Precision Paddleboards of Fort Lauderdale offers a large selection of paddles, accessories and boards for sale and for rent. Take a lesson or if you already have experience just rent out a board and take in all the beauty of the area. Precision also offers Night SUPS and light kits which allow you to take the boards our night or day. Get out on the water after work or just get a break from the sometimes harsh Florida sun. See all the fish that swim up and are attracted to your board as you navigate through the waters of Fort Lauderdale. Precision Paddleboards is an internationally accredited SUP school, one of the only ones in Florida. Beginners to advanced paddlers can learn the skills needed to improve your strokes. There are 4 different locations in Fort Lauderdale and Pompano Beach: Riverwalk of Fort Lauderdale, the Pelican Grand Resort, The Oar House Restaurant and Bar or the main Precision Paddleboards location in Fort Lauderdale on Ocean Drive. Night tours are offered regularly from the Fort Lauderdale location every Tuesday and Thursday nights. Occasionally there may also be a tour on Saturdays, check with the provider. The Night SUP tour includes a guided 2 hour tour on a NightSUP high-intensity LED stand up paddle boards, PFD, Leash and paddle $55. Experience what it's like to bring the moonlight along with you. Once a month, Precision will lead a tour to Islamorada for a Keys paddle through mangroves and over the shallow flats. Lobsters, rays, and fishes galore in calm, clear, warm water.